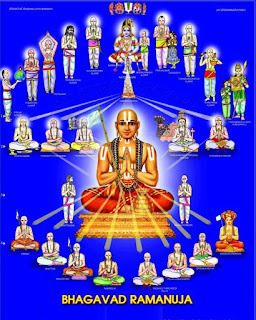 For full listing of our guru paramparai in multiple languages, please visit http://acharyas.koyil.org/. AchArya nishtai is one of the most important aspects of our sath sampradhAyam. Let us enjoy some aspects from our pUrvAchAryas lives on this topic. In the month of thai, we celebrate the annual thirunakshathram days of thirumazhisai AzhwAr, kurugai kAvalappan, kUraththAzhwAn and embAr. Let us see the AchArya nishtai with reference to kUraththAzhwAn and embAr. AzhwAn gave up all his wealth and surrendered to emperumAnAr and practiced mAdhukaram throughout his life. He was personification of renunciation. Though he was so wealthy he did not think for even a moment to give those riches to be with his AchArya and serve him. Even though he was greatly knowledgable, he never boasted his knowledge in front of his AchArya or any one. He always manifested great humility. This is why thiruvarangaththu amudhanAr glorifies him as "mozhiyaik kadakkum perum puagazhAn" (his glories are beyond the capability of words to explain) in his rAmAnusa nURRaNthAdhi. mAmunigaL explains the same about AzhwAn in yathirAja vimsathi saying "vAchA magOchara mahAguNa dhEsikAgrya kUrAdhinAtha". embAr too was a great AchArya nishtar. He was a sishya of periya thirumalai nambi. Once, he laid the bed for his AchArya, checked it visually and then lied down on it. emperumAnAr noticed it and was shocked. He asked embAr "How dare you lie down in your AchArya's bed? That is wrong to do". embAr calmly replied "I need to ensure that my AchArya is comfortable - so I personally checked it by lying down first. If I accumulate sins for that, so be it". Even at the cost of his own downfall, he ensures the comfort of his AchArya. emperumanAr became blissful hearing that. Again, mAmunigaL emphasises this principle in upadhEsa rathina mAlai saying "thEsArum sichchan avan sIrvadivai nOkkumavan" - the best sishya will serve/protect the divine body of his AchArya with great love. So, Let us also pray for such AchArya nishtai from these great mahAns. In the month of mAsi, we celebrate the annual thirunakshathram days of kulasEkara AzhwAr, maNakkAl nambi, thirumAlai ANdAn, thirukkachi nambi and piLLai uRangA villi dhAsar. Continuing the theme of AchArya nishtai, let us see the glorious aspects of maNakkAl nambi and piLLai uRangA villi dhAsar. maNakkAl nambi lived with his Acharyan uyyakkoNdAr and served him for 12 years together. During that time uyyakkoNdAr’s dharma pathini (wife) attains paramapadham – so maNakkAl nambi completely takes care of his AchArya’s thirumALigai (residence) and children. Once, when uyyakkoNdAr’s young daughters were returning from cauvery, they were stopped by a large puddle of muddy water and were hesitating to cross the same. At that time, nambi falls flat on the puddle and let the girls cross over by walking over him. On hearing this incident, uyyakkoNdAr becomes very pleased and blesses him with great devotion. uyyakkoNdAr asks nambi what he needs and nambi says he only wants to serve his AchArya. Being greatly pleased with nambi’s reply, uyyakkoNdAr instructs dhvaya mahA manthram (with meanings) as it is customary for AchAryas to instruct that (even repeatedly) when feeling happy with the sishya’s conduct. piLLai uRangA villi dhAsar was reformed by emperumAnAr. He and his wife ponnAchchiyAr became great devotees of srI ranganAthan and ideal disciples of emperumAnAr. 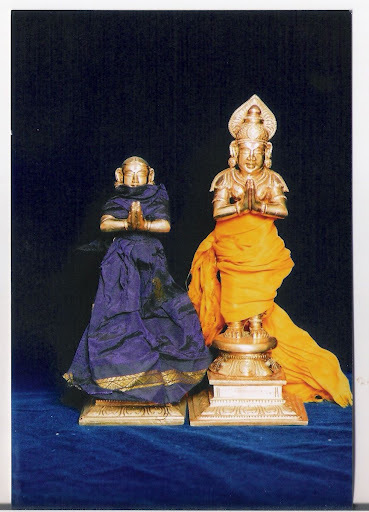 Both were most dedicated to emperumAnAr and demonstrated how an ideal couple should live in gruhasthAsramam by being fully engaged in bhagavath/bhAgavatha/AchArya kainkaryams. dhAsar was most dear to emperumAnAr and it is said that while coming out after taking bath, emperumAnAr would hold the hands of dhAsar for support. dhAsar was glorified by great scholars/devotees like kUraththAzhwAn for his great knowledge and devotion. ponnAchchiyAr too was a great scholar and knew the fine details of our philosophy and demonstrated the same in many occassions. In the month of panguni, we celebrate the annual thirunakshathram days of periya pirAttiyAr, thiruvarangaththu amudhanAr, nanjIyar, etc. Notably, panguni uthram is the day when srIranganAchiyAr and namperumAL grace us together and remind us about emperumAnAr’s saraNAgathy towards them for the welfare of everyone. Continuing the theme of AchArya nishtai, let us see the glorious aspects of amudhanAr and nanjIyar. 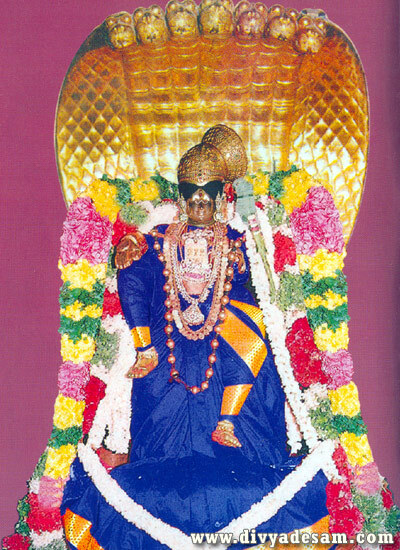 amudhanAr was having the control of srIranganAchiyAr sannidhi in srIrangam. emperumAnAr engaged amudhanAr through kUraththAzhwAn, reformed him and subsequently makes him a sishya of AzhwAn. 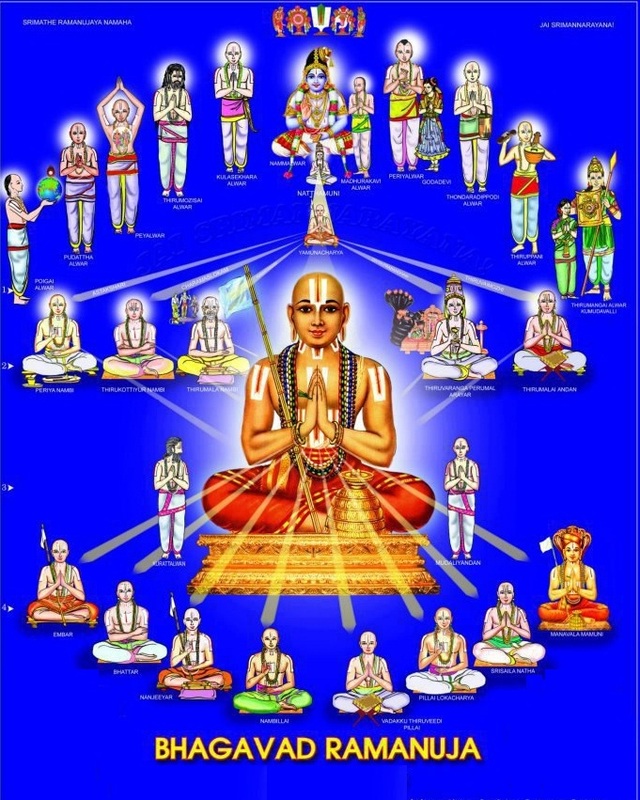 amudhanAr, being fully transformed, compiled rAmAnusa nURRanthAdhi. This prabandham is glorified as prapanna gAyathri by mAmuigaL in his introduction to this prabandham’s commentary. This prabandham brings out the glories of emperumAnAr and shows us that emperumAnAr’s lotus feet is the only way for our ultimate upliftment. amudhanAr was neither an AzhwAr nor his prabandham was fully glorifying bhagavAn, yet, this prabandham was included as part of dhivya prabandham and is regarded at par with AzhwAr pAsurams. amudhanAr’s nishtai towards emperumAnAr can be understood both from his words (rAmAnusa nURRanthAdhi) and his deeds (by giving up full control of thAyAr sannidhi to emperumAnAr). nanjIyar was a great vEdhAnthi before being reformed by parAsara bhattar. Eventually he became bhattar’s sishya, gives up everything and engages in full service to bhattar. In many instances he manifests total surrender and the ideal attitude of sishya towards his AchArya. After accepting sannyAsam, when a question arises if his Asramam will stop him serving bhattar (who was a gruhastha), he says he will give up his Asramam if it hinders his service to his AchArya. In the month of chithrai, we celebrate the annual thirunakshathram days of madhurakavi AzhwAr, emperumAnAr, mudhaliyANdAn, ananthAzhwAn, kOyil komANdUr iLaiyavilli AchchAn, vaduga nambi, kidAmabi AchchAn, engaLAzhwAn, nadAthUr ammAL, piLLai lOkam jIyar, etc. Continuing the theme of AchArya nishtai, let us see the glorious aspects of some of these mahAns. In upadhEsa raththina mAlai, after discussing 10 AzhwArs, mAmunigaL discusses madhurakavi AzhwAr, ANdAL and emperumAnAr. While the 10 AzhwArs are glorified for their devotion towards emperumAn, madhurakavi AzhwAr and ANdAL are glorified for their devotion towards their AchAryas nammAzhwAr and periyAzhwAr respectively. emperumAnAr too is added in the same category of AchArya nishtai by mAmunigaL due to his great devotion towards ALavandhAr and periya nambi. Each of emperumAnAr’s sishyas were great in their own AchArya nishtai towards emperumAnAr. mudhaliyANdAn went as an assistant for periya nambi’s daughter on the orders of emperumAnAr. 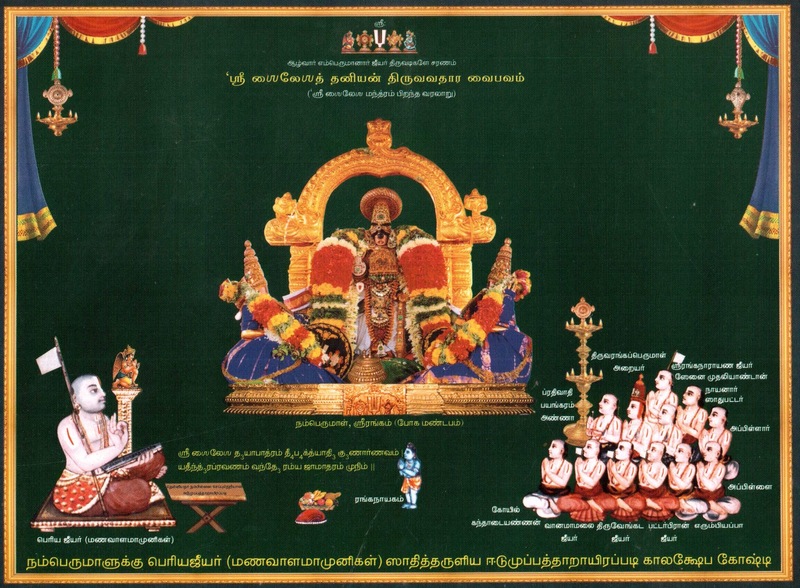 ananthAzhwAn went to thirumalA (thiruvEnkatam) and served thiruvEnkatamudaiyAn on the orders of emperumAnAr. komANdUr iLaiyavilli AchchAn gave up his life immediately after learning about emperumAnAr ascending to parampadham. vaduga nambi glorified emperumAnAr more than emperumAn himself. 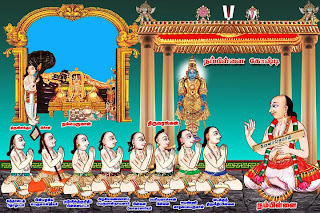 kidAmbi AchchAn could not bear emperumAnAr offering obeisances to thirukkOshtiyUr nambi in hot sun and lifted him up and thus was appointed by nambi as emperumAnAr’s main cook. These are shining examples of AchArya nishtai for us to have inspiration. In the month of vaikAsi, we celebrate the annual thirunakshathram days of nammAzhwAr, thiruvarangapperumAL araiyar, thirukkOshtiyUr nambi, periya thirumalai nambi, parAsara bhattar, vEdha vyAsa bhattar, thiruvAimozhi piLLai, etc. In anthimOpAya nishtai (http://ponnadi.blogspot.in/2013/06/anthimopaya-nishtai-6.html), a beautiful incident is highlighted from the life of thirukkOshtiyUr nambi - Once when emperumAnAr asks nambi "Please give me a few good instructions that I can take refuge on". nambi closes his eyes for some time and says "We were undergoing training under ALavandhAr. At that time, when he bathes in the river and takes a dip facing down, his upper back will resemble a beautiful shining copper pot. I always take refuge in that divine vision. You also consider the same as your refuge" - this incident is very popular and indicates that the sishya's focus should be on meditating on the AchArya's divine form. It is said that, nambi used to stay on the upper level of the main gOpuram in thirukkOshtiyUr temple meditating on ALavandhAr and always reciting the manthram "yamunaithuraivar" (yAmunAchAryar). 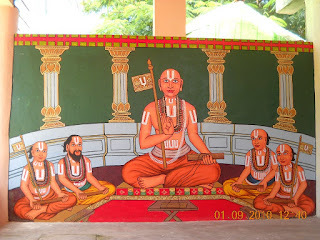 Similaly, thiruvAimozhi piLLai was greatly attached to kUra kulOththama dhAsar who taught him the most important principles of our sampradhAyam based on piLLai lOkAchArya’s orders. In this month of Ani, we celebrate the annual thirunakshathram days of periyAzhwAr, nAthamunigaL, thirukkaNNamangai ANdan, vadakkuth thiruvIdhip piLLai and vAdi kEsari azhagiya maNavALa jiyar. 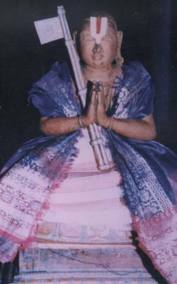 vadakkuth thiruvIdhip piLLai (srI krishNa pAdha) was a very dedicated disciple of nampiLLai lOkAchArya. He was totally surrendered to his AchArya and would always serve his AchArya. Though he was married, he was showing no interest in marital life. Feeling worried vadakkuth thiruvIdhip piLLai’s mother approaches nampiLLai and informs him about the situation. nampiLLai instructs his disciple to engage in marital life to beget virtuous offsprings. By the blessings of nampiLLai and srI ranganAtha, vadakkuth thiruvIdhip piLLai’s wife gives birth to two divine children. Both of them remain brahmachAris (celebate) throughout their life and takes our sath sampradhAyam to great heights by clearly establishing the divine philosophy of AzhwArs and AchAryas. Similarly vAdhi kEsari azhagiya maNavALa jIyar, originally was a very simple and not so learnt disciple of periyavAchchAn piLLai (who is another dear disciple of nampiLLai). Purely by the grace of periyavAchchAn piLLai, vAdhi kEsari azhagiya maNavALa jIyar becomes a great scholar and goes on write the word­by­word meanings to thiruvAimozhi, gIthai veNpA (a collection of pAsurams reflecting the meaning of each slOkam of bhagavath gIthA) and many other granthams. In this month of Adi, we celebrate the annual thirunakshathram days of ANdAL, ALavandhAr and prathivAdhi bhayankaram aNNan. mAmunigaL highlights the thirunakshathrams and avathAra sthalams of all AzhwArs and emperumAnAr in upadhEsa raththina mAlai. While doing that, he discusses ANdAL along with madhurakavigaL and emperumAnAr, even though she is bhUmi pirAtti herself - because all three are AchArya nishtars (fully dependent on their AchArya). ANdAL declares in nAchchiyAr thirumozhi “vittuchiththar thangaL dhEvarai vallaparisu varuvipparEl athu kANdumE” (When periyAzhwAr brings his God infront of me, I will see him). madhurakavigaL’s AchArya nishtai on nammAzhwAr is well known and emperumAnAr too was greatly surrendered to nammAzhwAr, ALavandhAr and periya nambigaL specifically. ALavandhAr too declared his total dependence on nAthmunigaL in sthOthra rathnam. He initially said “athra parathra chApi…” (I am surrendered to nAthamunigaL in this world and the other world). In the end, he concluded “akruthrima… pithAmaham nAthamunim…” (Accept me for my grand father nAthamunigaL, not for my deeds). Finally, prathivAdhi bhayankaram aNNan too mentioned to mAmunigaL while surrendering unto him that he is a tormenter of the others who challenge visishtAdhvaitham, but he is submissive to srIvaishNavas. In this month of AvaNi, we celebrate the annual thirunakshathram days of srI ranganAtha (periya perumAL), periyavAchchAn piLLai, nAyanArAchchAn piLLai and appan thiruvEnkata rAmAnuja embAr jIyar. Continuing the theme of AchArya nishtai, let us see the glorious AchArya nishtai of periya perumAL. srIman nArAyaNan, though being supremely independent, chose various AchAryas/gurus to show the path to others. In bhagavath gIthA, He emphasised the need for approaching a guru, serving him and learning the truth from him. He demonstrated the same in his avathArams. As srI rAma, he learnt under vasishta and viswAmithra. Still, that did not satisfy him. As krishNa, he learnt under sANdIpani muni. But he did not seem to be satisfied there as well. 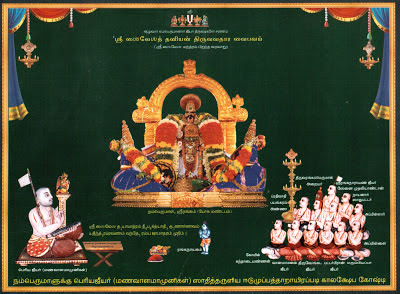 During srI rAmAnuja’s times, srI rAmAnuja presented sanka/chakra to thiruvEnkatamudaiyAn (srInivAsa) when there was a dispute on his identity (thus accepting srI rAmAnuja as his AchArya since accepting of sanka/chakram is part of pancha samskAram to establish the true identity of the jIvAthmA). thirukkuRungudi nambi too accepted srI rAmAnuja as his AchArya, had manthrOpadhEsam from him and became to be known as srIvaishNava nambi. Yet, emperumAn seemed to have been not fully satisfied since he did not fully manifest the qualities of a sishya then. When mAmunigaL arrived in srIrangam, srI ranganAtha felt really happy thinking that mAmunigaL would be the best AchArya for him. So, he first ordered mAmunigaL to give series of lectures on thiruvAimozhi to first manifest the quality of learning the truth under an authentic AchArya. 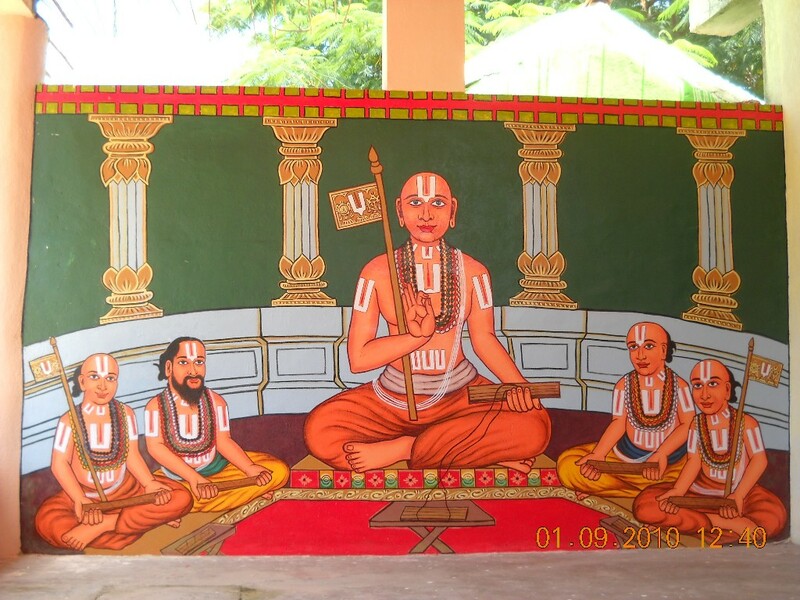 On completion of the lecture series (on Ani thirumUlam), periya perumAL offered the glorious “srIsailEsa dhayApAthram” thaniyan glorifying his AchArya. Not only that, he also propagated the thaniyan every where and ordered that to be recited at the beginning and end of dhivya prabandham recitation. He also submitted his best wealth - sEsha paryangam (serpant throne) to mAmunigaL as it is customary for the sishya to honor the AchArya with the best material. Thus, periya perumAL derived great satisfaction by accepting mAmunigaL as his AchArya. So, Let us also pray for such AchArya nishtai from periya perumAL himself.